Andy Murray battled past a tired Gilles Simon in Madrid to secure back-to-back Masters Series titles. The Briton, 21, followed up his semi-final win over Roger Federer with a 6-4 7-6 (8-6) victory. Simon struggled physically, having needed final set tie-breaks in his previous three matches, including Saturday's defeat of Rafael Nadal. 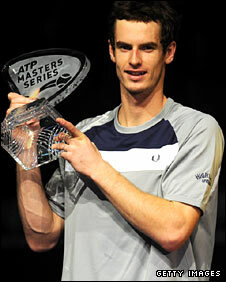 Murray, the world number four, won his first Masters Series title in Cincinnati in August. He becomes the first British player to win two titles at the elite Masters level, which is below only the Grand Slams in importance, with both Tim Henman and Greg Rusedski having won in Paris during their careers. Murray is also the first Briton to win four tournaments in a season, having taken titles in Doha and Marseille earlier in the year. In truth, the Scot was well below his best in Sunday's final as he failed to find any rhythm against an opponent who appeared exhausted from the early stages. And while the Frenchman struggled to cope, Murray was able to rely on the almost impregnable serving that saw off Federer on Saturday. He made 67% of first serves over the one hour and 34 minutes and did not face a single break point, although he had to fend off two set points in the second set tie-break. Murray was largely content to rally from the baseline and wait for errors from Simon, and it worked as early as game five when he forced three break points and converted the third with a winning lob. He had little trouble seeing out the set, taking it with a superb service game that included three aces, and had an early chance in the second set but played a wild forehand on break point. It proved to be the pattern for much of the match, with both players hitting occasional winners but failing to string them together. Murray saw off a brief threat in game six with a backhand winner down the line past the on-rushing Simon and it came down to a tie-break, which at last produced some real drama. Brilliant stuff from Murray. It surely won't be long before he wins a Grand Slam. The British number one recovered an early mini-break but from 3-2 up played three drop shots in a row, two of which were unsuccessful. He was not to be deterred, however, and went for another when facing two set points at 6-4 down, just about getting away with it and going on to win four straight points, Simon missing with a volley on match point. "I planned to play a little bit better than that from the back of the court," said Murray. "Both of us made a lot of mistakes but both of us were a little bit tired from yesterday, him probably more than me. "But my serve this week has been awesome and that's the reason why I won the tournament. I don't think he had a break point in the whole match. "I think he'd won his last five finals so he's tough in finals, I knew it was going to be a difficult match. "Maybe I put a little bit too much pressure on myself because I was expected to win and I knew he was going to be tired but I saved my best tennis until right at the end and deserved to come through." Murray, who has already qualified for the end-of-season Masters Cup in Shanghai, will head to St Petersburg next week to defend the title he won last year.